5:30pm-7pm: Food, live music and science stations. 7pm: Movie begins in the WRAL 3D Theater, followed by commentary. Yo ho, yo ho, a pirate’s life for me! Ahoy mateys! Come celebrate the 300th anniversary of one of the most infamous pirates to sail the waters of North Carolina — Blackbeard. He was the captain of the Queen Anne’s Revenge, but lost the ship (some say on purpose) when it ran aground at Beaufort Inlet. It’s hard to be a pirate, especially if you don’t have a ship! See the first adventure of Captain Jack Sparrow as he tries to reclaim his precious ship, the Black Pearl. But be careful — sometimes things are not as they seem, and you could be trapped in a curse for all eternity! So grab your hat, your sword, and your eye patch and come aboard to see the June installment of Finally Friday: Pirates of the Caribbean: The Curse of the Black Pearl. Plus, learn everything you ever wanted to know about the science behind sea monsters, mythical creatures, pirates, treasure maps, ship navigation and much more. We’ll host David Moore, nautical archeologist and historian, who has conducted field research dating from the 16th to the 19th centuries. David will help us separate the facts from the flotsam following the screening. Don’t miss it! Along with the movie and dynamic Q&A with our expert, be prepared for exciting trivia with cool prizes for correct answers and less cool prizes for incorrect answers! 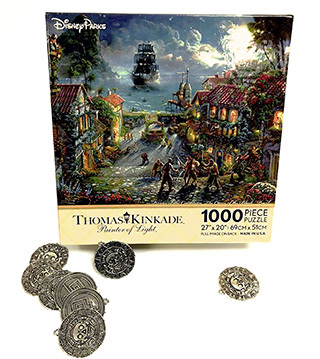 The Grand Prize winner of the trivia contest will take home a Thomas Kinkade, 1000-piece puzzle from the Disney Parks franchise Pirates of the Caribbean: The Curse of the Black Pearl, plus a cursed doubloon! Pirates of the Caribbean: The Curse of the Black Pearl is rated PG-13. 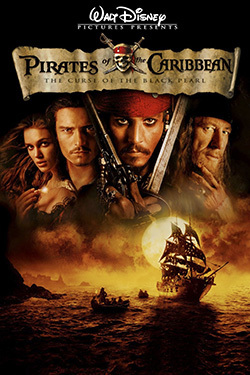 “Pirates of the Caribbean: The Curse of the Black Pearl” (2003) was directed by Gore Verbinski and starred Johnny Depp, Orlando Bloom, Geoffrey Rush and Keira Knightley. Based on the Disney theme parks attraction, “Pirates of the Caribbean” was the first release under the Walt Disney Pictures banner to be rated PG-13 by the MPAA. It grossed over $654 million worldwide and many consider it to be the best entry in the series. In addition to winning the Screen Actors Guild Award for lead actor, Johnny Depp also earned Oscar and Golden Globe nominations for his portrayal of Jack Sparrow. The film was nominated for four other Academy Awards. The story follows the adventures of pirate Jack Sparrow and blacksmith Will Turner (Bloom) as they rescue the kidnapped Elizabeth Swann (Knightley) from the cursed crew of the Black Pearl, captained by Hector Barbossa (Rush), who become undead skeletons at night. 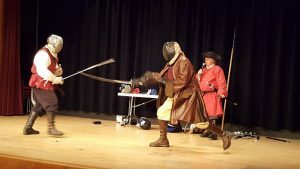 Head into the WRAL 3D Theater early to see “pirates” from The Sword Conservatory demonstrate the various fighting styles used by both pirates and the Royal Navy (18th-19th century), along with some ship-boarding techniques. These pirates will be using cutlasses and sabres in non-choreographed duels, either one-on-one or with multiple fighters. Demonstration will begin at 6:40pm. The Sword Conservatory is a non-profit organization dedicated to the research and teaching of sword fighting styles from the Medieval period, the Renaissance, the 18th and 19th centuries, and modern sport fencing. Learn to Fight like a Pirate! Pirates of The Sword Conservatory will show you how to fight with a cutlass. In our lesson, you will learn some basic attacks and defenses. Afterwards, you may even get a chance to practice what you’ve learned by fighting one of our pirates with a foam cutlass! Pirates had more to worry about than hiding their gold or running from the law. A pirate had, above all, to keep his ship floating. This took an understanding of the principle of buoyancy. At this cart you will see what it takes to keep something denser than water floating safely above the murky depths. Test your skills and knowledge while floating a clay boat and operating a Cartesian diver. Pirate Alchemy: Turning Pennies to Gold! Get rich quick by turning an ordinary penny into “silver” and then “gold”! We can use a simple chemical reaction to convert pennies to “silver,” and then with a little heat, we can turn that “silver” to “gold”! Explore the ancient art of alchemy as we turn our pennies to pirate treasure. It’s the most famous island in the world of piracy, but do you know what its name means? Come discover the animals that gave their name to this pirate island. Learn about the real pirates who plundered the North Carolina shore from Cape Fear to Currituck. Discover the science behind the most famous mythological sea creatures and learn more about the real animals on which they are based. In order to get one of our exclusive buttons for this film, you will have to complete an adventure. Collect the clues from the various stations, and you will become a real pirate! Come learn about the “rugged” fishes that take advantage of Caribbean reefs and sunken shipwrecks. Much like pirates, arthropods have conquered both land and sea. So, come learn about some of our “crabby” friends with the Arthropod Zoo’s very own crustacean station. 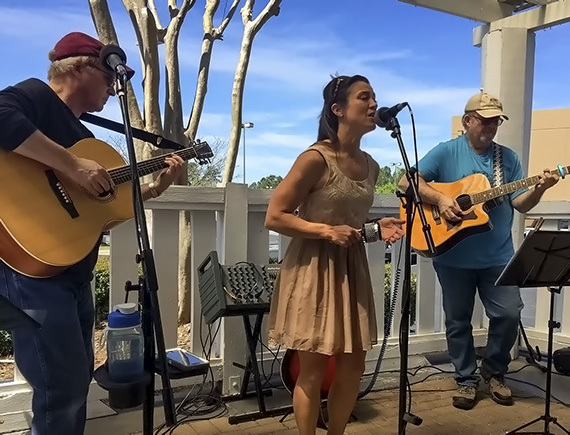 Loos Change a.k.a “Loos Doubloons” (on this occasion) is an acoustic trio based in Raleigh that plays a wide range of material from the 1960s to today. From the British Invasion to Americana, classic country, R&B, and pure pop, Loos Change has something for everybody. Don’t miss them at this month’s Finally Friday event!